The natural gas market remains in a tight trading range between a high of $4.65 and a low of $4.50 for the prompt month. Traders are waiting for an updated storage report before making the next move. The bigger question might be “What does summer have in store for us.” A cool summer will bring gas prices down with lower demand from power plants. I’d have to say that the cool start to spring might be making all the “bulls” and long traders have a second thought on demand for a hot summer. This entry was posted in Natural Gas Market Info on April 16, 2014 by coreenergy. During the past seven days natural gas has been as low as $4.22 and as high as 4.703. That’s over a 10% gain and from a technical viewpoint perhaps a bit overbought. 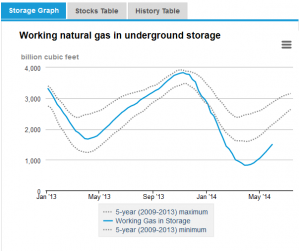 There is obviously fear in the gas market that storage injections will not meet the needed amount of gas in the ground by next winter. With prices this high it’s sure to have power plants that can burn coal ….burning coal. For consumers we’ll need some early big injections to change the mindset of the “bulls.” I expect a pullback even if temporary as it’s time for this market to take a breather. This entry was posted in Natural Gas Market Info on April 10, 2014 by coreenergy.